You all know I'm a huge lover of 'To-Do' lists. I write everything down, whether it's to get me excited about something like a Bucket List or plainly to GET STUFF DONE... you can never go wrong with them. 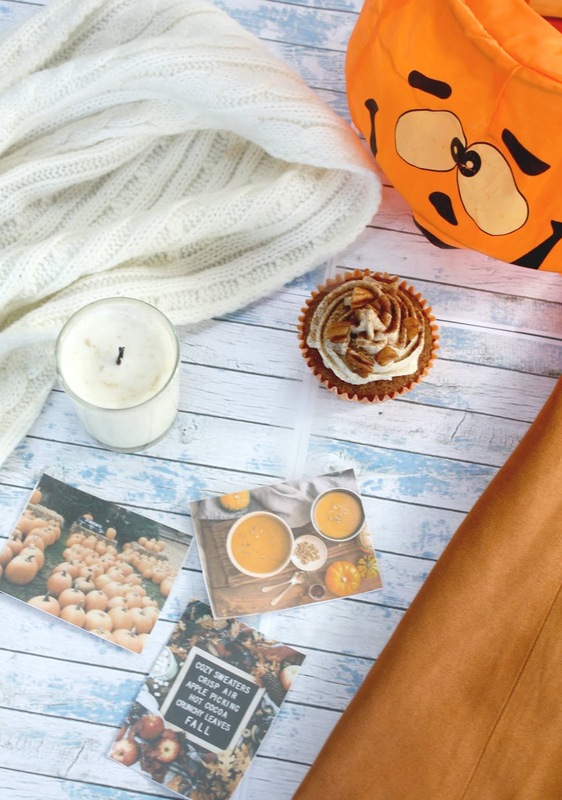 As Autumn is my favourite season of the year, I thought I would kickstart October with an Autumn To-Do list, filled with all the things I want to do to prepare for the Autumn months and goals and things I'd like to achieve this season. To read more Autumn-themed posts I've put up on Just Morgs just click here, and let me know in the comments what you're most excited for this season. You'll be seeing these go up a lot on my blog in the next few weeks and I could not be more excited! Autumn baking makes me think of all things cinnamon, pumpkin-spice, apple and toffee and aside from Christmas it's my favourite season for baking. Let me know if there are any special requests you have for recipes coming up in the next few weeks - I'd love to know. *And the picture above is a sneak peek at a recipe coming up next week. Yep you read that right - but hear me out before you all think I'm crazy! This September (after binge watching UnJaded Jade revision videos) I decided to try something new that she does and try getting up at 5:30am each day. Normally I'm still dragging myself out of bed at 7:30 on a school morning so I doubted how long this would last, but after a month of it I actually love it! Waking up this early each day is not only eerily peaceful but gives me time to do exercise // yoga in the morning, actually enjoy my breakfast and (more importantly for Year 11) get 45mins of Revision done before I even get to school. Overall I'm loving this and it makes me feel so much more productive so I want to make sure to continue this in the Autumn months! Gone are the months of shorts and a bralette like I used to sleep in through Summer and our UK heatwave! This month I definitely need to get myself some cosy PJ's to get me through the winter, and so this is on my To-Do list for sure. Too early to buy Christmas ones oops? Out of all the exercise I do, generally I'm 'a runner' and while it may not feel like it at the time when I'm a sweaty mess, I really do love it. The gym will always be there, but one of my favourite things to do as the evenings get darker is to go on night runs. So much more peaceful and I can't be the only one who finds it easier to run during the evening? I've already seen pumpkins start to pop up in all the Supermarkets near me and I can't wait! Here in the UK Halloween is still a big thing but not as much of a widely celebrated holiday like in America, but I still love planning things with friends and family (whether that be trick-or-treating like I used to love when I was younger, Halloween parties or horror movie nights.) I also love seeing everyone's carved pumpkin designs each year. I don't know why it is, but this time of the year seems to be when all my favourite series and tv shows start up again. At the moment most of my evenings are already taken up by classics like The Great British Bake Off, Strictly, X-Factor and that's not even until I'm a Celeb and Doctor Who are thrown into the mix! Going to be waving goodbye to most of my free time aha, but hopefully I can keep up with all my favourite programs this Autumn. What are your watching at the moment? This time of year just reminds me of all things toffee apples, marshmallows, cosy nights and fireworks. It's a long way off in November that the fireworks displays start but I can't wait to go to this year to the amazing ones around my area with friends. QOTD: DO YOU CELEBRATE HALLOWEEN? Running at night is always so much nicer I agree! And that cake looks so good, can't wait for your baking posts to come out. I like the idea of hosting a Halloween movie night. That sounds so nice and fun! O boy your to-do list sounds so fun, getting me super excited for Autumn. It truly is the time of the year for baking 😁. Yes we celebrate Halloween simply because my mom's birthday is on the same day, plus it's an entertaining holiday here in the US. I love getting ready for Autumn and Winter, things such as new pjs are a must. There's no better way than cute Winter pjs. I'm really looking forward to Autumn there's soo much great stuff going on. That cupcake looks amazing! 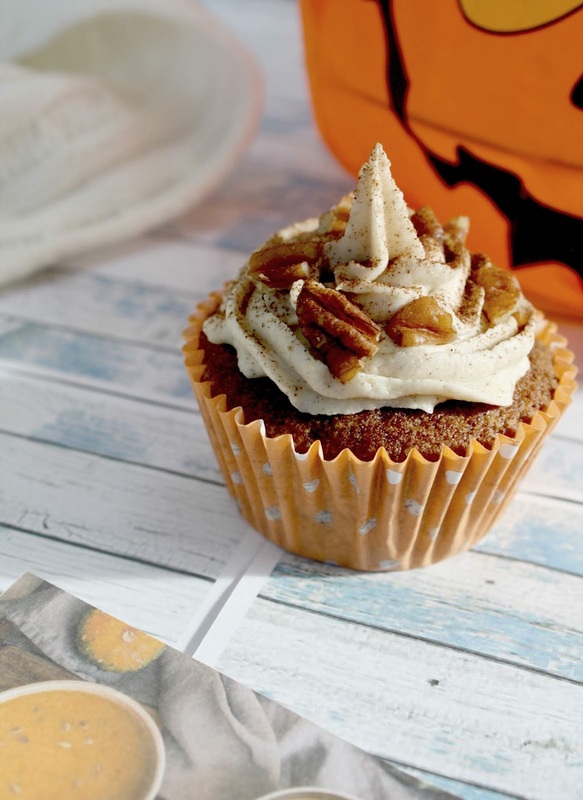 Oh my pumpkin-spice is perfect, would love to try in a cupcake. Good luck with your autumn to do list! Oooh, I am on board with carving a pumpkin! Hope you'll enjoy it! It's great that you enjoy night runs. Stay safe! Hope you'll find some nice fireworks displays :). Yess this post is making me get into the fall spirit!! So cute!! Ooh good list! I just posted my Fall Bucket List! I love the idea of getting a new pj set to prep for Winter -- pj shopping is definitely one of my favorite cold weather hobbies! You've got some great things on here! I am all about Halloween and the season, so I am totally embracing any chance to celebrate! These are some great ideas. I definitely prefer running at night and will be hosting a Halloween horror movie night this year.